Lookup HTML Entity Characters – Useful Tool To Have Valide Code! Using HTML entities is the right way to ensure all the characters on your page are validated. However, often finding the right entity code requires scanning through 250 rows of characters. This lookup allows you to quickly find the entity based on how it looks, e.g. like the letter c for ©. 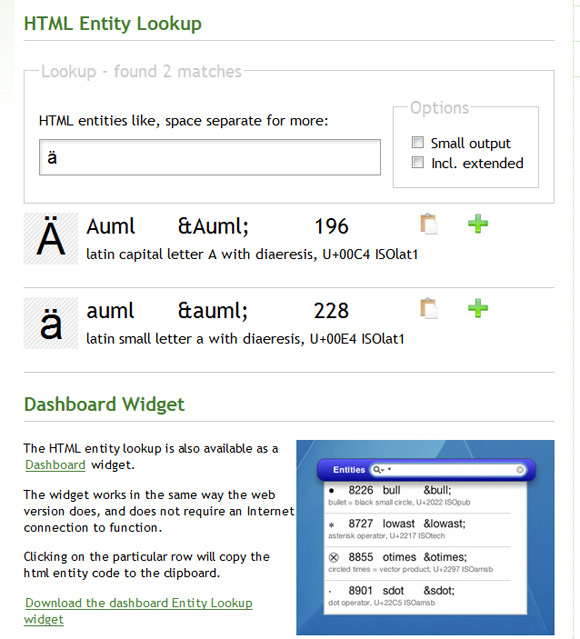 The HTML entity lookup is also available as a Dashboard widget. The widget works in the same way the web version does, and does not require an Internet connection to function. Clicking on the particular row will copy the html entity code to the clipboard. I know, there are also other resources, like cheat sheets, code editors which have them implemented. But I think it’s a good alternative to find an entity pretty quickly.